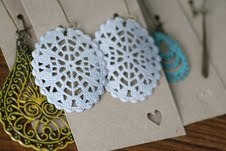 Our earrings are also one of a kind in that we powder coat light weight metal filigrees fun colors. These look professional and sell at $10 a pair. Our clips are one of a kind. I design various flowers for big and little girls. $3.5 We use many different materials from felt to crepe paper. Different for every show.